Get your shopping money back with Shopback! Do you like online shopping? I do! The things I don’t have to try on in a fitting room, I buy online. It’s very convenient because I don’t have to drive through hellish traffic and pay for parking. Whatever I order will just be delivered to my door. But did you know that you can actually get some of your money back when you shop online? Yes! It’s true. 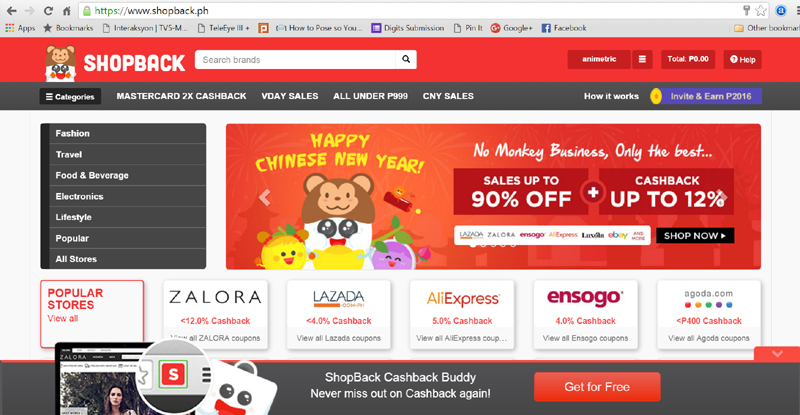 I recently got introduced to Shopback, an online rebate site https://www.shopback.ph with partner merchants all over the internet. The front page alone lists at least half a dozen online stores I regularly shop at — Lazada, Zalora, Ensogo, Agoda, Ebay, Luxola… wow, right? By registering for a Shopback account and clicking through the Shopback site whenever you shop, you can get anywhere from 2.5% to 12% of your money back! When I went to the US last December, I noticed that powerbanks there are expensive and well… not very powerful. My mom uses a Samsung Galaxy S6 and her mobile data is always on. Her phone runs out of power rather quickly and so she always needs to bring a powerbank. She has a big bulky one that charges ever so slowly… ugh! I had my Asus ZenPower 10050mah Powerbank with me at the time and she tried using it. She was amazed at how fast it was able to charge her phone and how it could fill up her battery up to 100% 4x over. It’s really the best Powerbank ever! 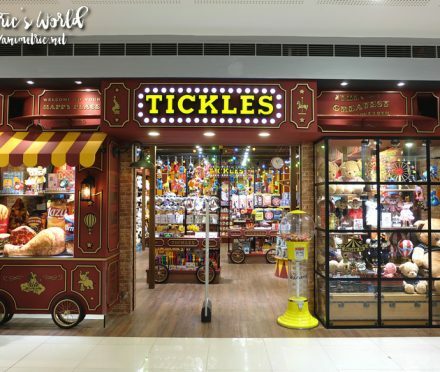 So I thought I’d buy her one when I got back to Manila. I logged in my Shopback account and clicked through Lazada. 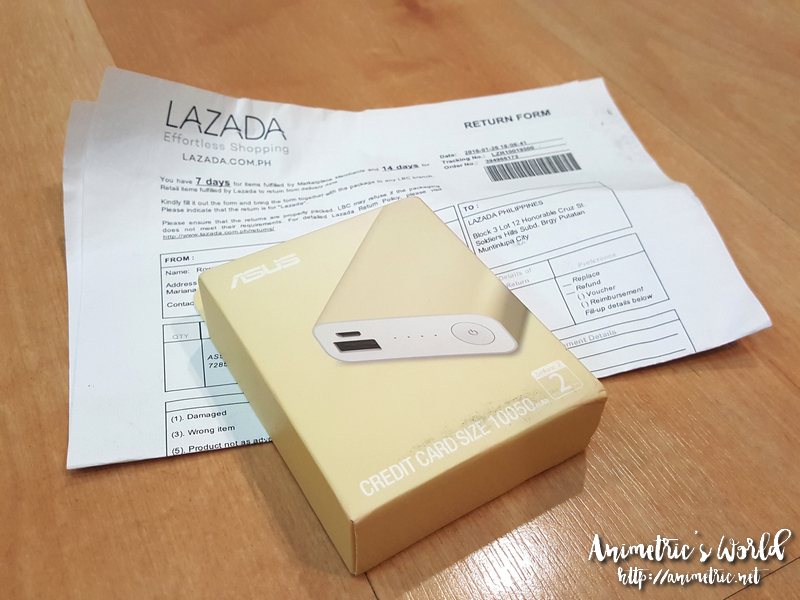 I’m an existing Lazada customer and so I’m entitled to 2.5% rebate for electronics. The rate is higher for non-electronics. So yeah, 2 days after I ordered a gold Asus ZenPower 10050mah Powerbank it arrives on my doorstep. I’ll probably ask someone who’s going to the US this summer to mail it to my mom. Okay next shopping session: Zalora. I ordered some stuff from Zalora last October which never shipped. The funny thing was the order wasn’t cancelled either. It just disappeared. It had already been paid for what the heck! Good thing they credited what I spent back to my Zalora wallet. 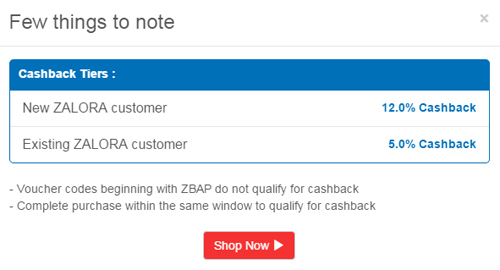 So anyway when you shop at Zalora, you get 12% cashback if you’re a new customer and 5% if you’re an existing customer. 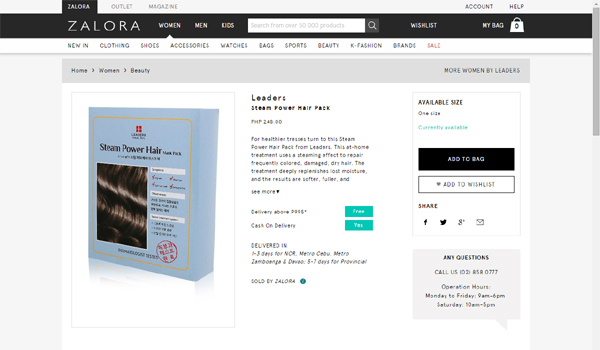 So since there aren’t any Leaders stores near me, I decided to spend my Zalora credit on Leaders masks. I also threw in a Gilette After Shave Splash for hubby. But here’s the thing, you don’t get a rebate if you use store credit. If you want to get cash back, you have to use the usual payment methods — Paypal, COD, credit card… but no, not GCs or store credit. 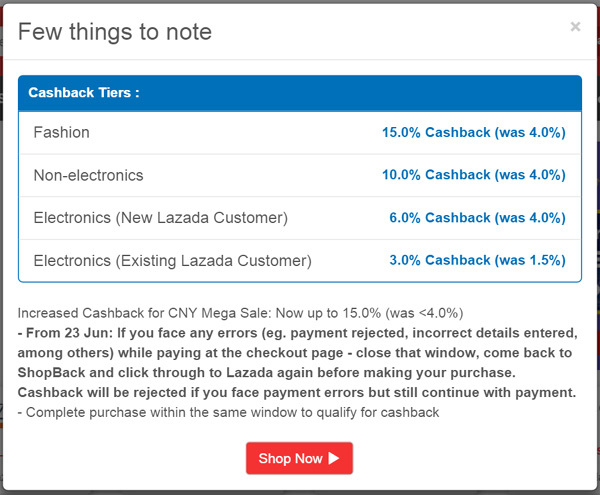 So here’s my Shopback Cashback Information page. It’s actually pretty easy to track how much money you’re going to get back. I’m getting P22.17 back from Lazada and nothing from Zalora since I used store credit from my Zalora Wallet. You can cash out when you reach P300 and Shopback will credit the money to your preferred bank or Paypal account. 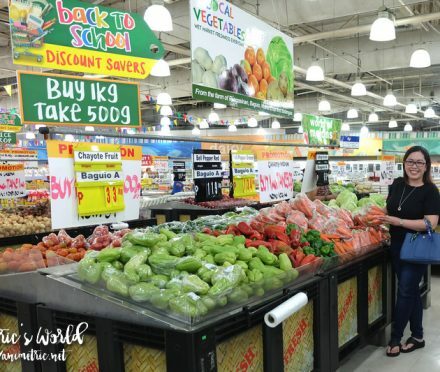 So are you ready to get your cash back when you shop via Shopback? 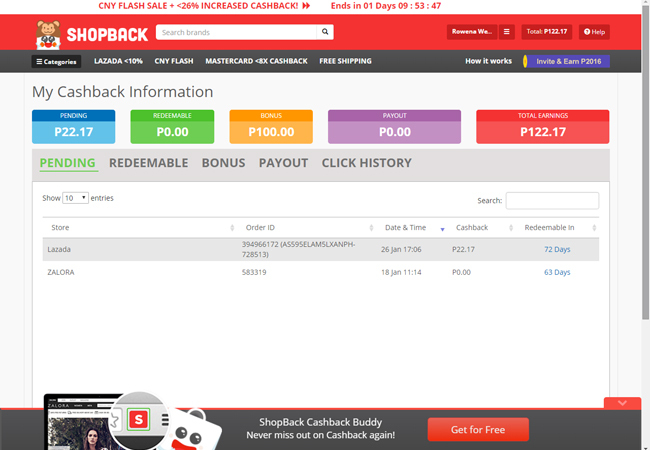 Sign up via my referral link HERE and get P100 cash credited to your Shopback account instantly! 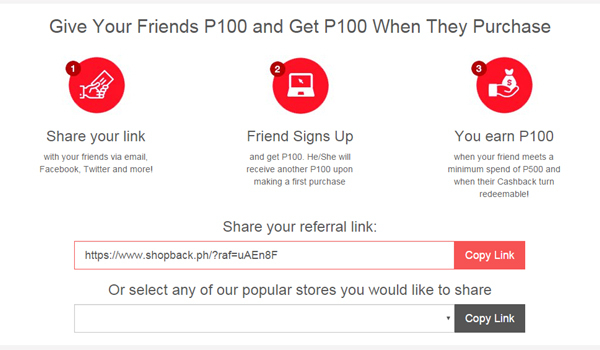 When you have a Shopback account, you can get your own referral link too and earn P100 every time a friend signs up through it. Happy shopping! I should’ve signed up for this earlier on lol. Need to buy a Valentines gift for that someone special in your life? Check out Shopback’s Valentines Day Promo — there are Valentines sales up to 90% off and you can get up to 12% cashback!